Item number 2946/56 from the MOA: University of British Columbia. 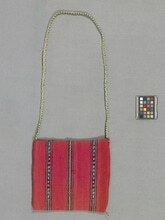 Small square pink woven bag with three vertical lines and a diamond-patterned strap. The stripes are all patterned with thick blue borders. The centre stripe has a diamond pattern in blue and light brown against a pink background. The strap is long and thin with dark green diamonds outlined in white.